Equip your Miele cleaner with the deluxe power brush. - Full 13 5/8" wide cleaning path. - 5 position height adjuster. - Free standing capabilities, no more having to dock the power nozzle on the machine to move furniture or take a break. - Quick release latch so you can easily remove it from the wands without bending over. - Headlight allows you to see in those dark closets and hallways. 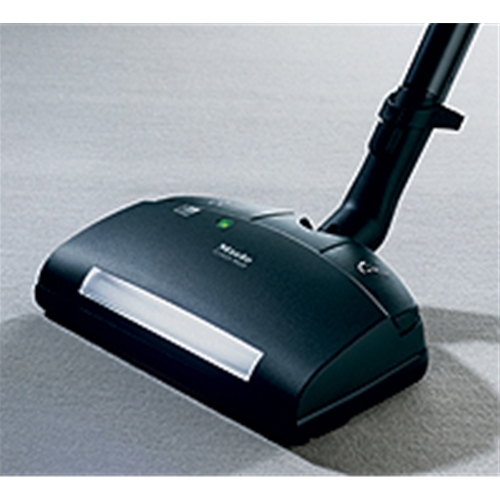 - Auto Shut-off Carpet saver makes your job even easier; just stand it up, and it automatically turns off the brush. This allows you to stop and move furniture without having to turn off the machine.